This ferris wheel is part of a system that helped determine just how strange the ordinary stuff around us can be. In the G-Zero experiment, researchers carried out a precisely tuned survey for ephemeral particles that appear only briefly inside matter. It's been said that anything worth doing takes time - just ask those scientists involved in what's known as the G-Zero experiment. Nearly two decades ago, an international coterie of more than 100 scientists came together with the goal of pinpointing just how strange the ordinary stuff around us can be. The G-Zero collaboration proposed a precisely tuned survey for ephemeral particles that appear only briefly inside matter. Specifically, they wanted to measure the effect of strange particles in the proton, the sub-atomic particle found deep inside the nucleus of every atom in our universe. It was a massive undertaking. The full experiment would take more than 15 years to accomplish, with tons of new equipment and exclusive use of one third of Jefferson Lab's experimental space for over two years. In addition, it would benefit from the assistance of nearly 50 undergraduates, graduate students and postdoctoral researchers and hundreds of support personnel. Now, the G-Zero experiment is publishing the first of several of papers detailing its final conclusions. Its findings were published in the January 8 issue of Physical Review Letters. It took humankind a full two thousand years from the first recorded suggestion of the atom's existence until one would actually be pried apart for a glimpse inside. Democritus, a Greek philosopher in the third century B.C., spoke of the "a-tom" as the smallest component of matter, from the Greek meaning "cannot be split." What we now think of as the atom - consisting of a nucleus and its electrons - was first described by John Dalton in the early 1800s. Later that century, scientists found that they could strip electrons out of the atom. Then, in the early twentieth century, they found that the nucleus contained even heavier particles, which were dubbed protons and neutrons. Fast forward to the 1960s, when theoretical physicists proposed that protons and neutrons have building blocks of their own - particles called quarks. Shortly thereafter, researchers at SLAC National Accelerator Laboratory conducted experiments that demonstrated that quarks really did exist. Decades of research have confirmed that a proton contains three permanent quarks. But that's not all. There is also the force that binds the quarks together to make a proton. This "strong force" binding the quarks is an integral part of the structure of the proton. "Protons and neutrons are very unusual objects," says Doug Beck, a professor at the University of Illinois at Urbana-Champaign and spokesman for the G-Zero collaboration. "Their matter constituents, the three quarks, account for so little of their overall mass. Most of their mass is actually energy: the energy of the fields generated by the strongly interacting quarks and the energy of motion of the quarks themselves." The G-Zero researchers were particularly interested in these strong force energy fields. The energy from these fields appears in the form of particles inside the proton called "sea particles." These particles bubble up for the briefest of moments before melting back into energy fields. The sea particles, also called virtual particles, can take the form of quark pairs. Pairs of up quarks and pairs of down quarks are the most likely pairs to appear briefly in this sea, because they are the lightest of quarks. The proton's permanent quarks consist of two up quarks and a down quark. The next-heaviest quarks, strange quarks, are also thought to be present in the sea as virtual particles. G-Zero scientists proposed their experiment in 1993 to measure what effect these temporary residents of the proton have deep inside the proton. "In the paper, we report what we have seen of the virtual quarks spawned by the energy fields," Beck asserts. 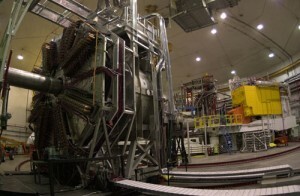 The G-Zero custom detector system (left) is installed and ready to run in Jefferson Lab's Hall C.
The proton is not a rigid object that can be laid out on a lab table to be weighed, observed and otherwise poked and prodded. If you were somehow able to isolate a proton and plop it onto a slide under a light microscope, you still wouldn't be able to see it. The visible light that bounces off ordinary small objects and into the microscope lens and your eye would simply pass by the proton. To “see” the proton, scientists need a different kind of probe. At Jefferson Lab, electrons are used instead of visible light. An electron is small enough to interact with the proton. A properly prepared electron can bounce off of the proton, knock it about or blow it apart. Jefferson Lab prepares electrons for experiments using the Continuous Electron Beam Accelerator Facility, or CEBAF, accelerator. In the accelerator, electrons that have been freed of their atoms are pumped up to high energy. They are then sent into one of CEBAF's experimental halls and into a target material. There, the electrons may interact with the protons inside the target. With a little energy, an electron bounces off a proton. Add a bit more energy, and the electron knocks a proton out of the nucleus in which it resides. In G-Zero, scientists were interested in bouncing electrons off the nuclei of hydrogen atoms. Two types of hydrogen were used - ordinary hydrogen, the simplest nucleus consisting of a single proton, and deuterium, which has both a proton and a neutron. In particular, the G-Zero scientists wanted to measure the protons that came flying out of the target or the electrons that succeeded in bouncing off the protons and neutrons. The particles were intercepted by detector systems that recorded their flight path. A flight path of a proton or electron can either directly or ultimately provide information about the protons that were knocked out. Probing the proton with electrons isn't going to provide the same information that you'd get by looking at something with a grade-school microscope. The proton is too small to have a visible color, nor can it be described by how rough or smooth its surface appears or how squishy or solid it feels. Instead, physicists have a different set of properties they can measure. For instance, the proton has an electric charge. The quarks inside the proton each have an electric charge, which gives the proton its overall positive charge. By scattering electrons from the proton, physicists can tell how much of the total charge participates. That allows them to peer inside the proton to see variations of charge inside the proton - its so-called charge distribution. The distribution of electric charge gives physicists a handle on where the quarks are in the proton. "And so a proton is not an object that's a point, it's an object of some size. And it's made up of some quarks that are charged. And so you can ask how are those quarks distributed inside the proton," Beck explains. The quarks' electric charges also provide scientists a way to measure how quarks are moving around inside the proton. "When charged objects move around, they can create a magnetic field. And so we measure what we call the magnetization," Beck says. Specifically, just as the G-Zero scientists are measuring the distribution of charge in the proton, by looking at the proton from different angles, they're also measuring the distribution of magnetization. "We have opened a new window on this structure, separately measuring the contributions of virtual strange quarks to the electric and magnetic properties of the nucleon," Beck says. 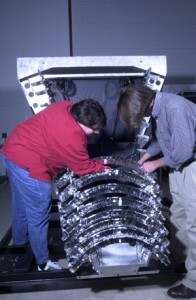 Researchers assemble one of eight detector segments for installation in the ferris wheel-shaped G-Zero apparatus. The result from this years-long effort to measure strange matter in the proton has revealed that strange quarks don't charge up or magnetize the proton all that much, at least at low resolution. "These results indicate strange quarks make small, less than 10 percent contributions, to the charge/magnetization distributions. Ten percent compared to the total charge and magnetization distribution," says David Armstrong, a G-Zero collaborator and professor at The College of William and Mary. "The extra quarks that we measured in the sea are not significantly changing the size or shape and the magnetic strength." So although the researchers did measure the virtual strange quarks in the proton, it appears that these quarks either don't dally long enough inside the proton to have a significant effect on its properties before melting back into strong force energy or don't get far enough away from each other to be seen (i.e. they could have an effect separately, but as a close pair, any effect they would have cancels out). The G-Zero scientists say that this is surprising, since other experiments give strong indications that there are a significant number of strange quarks in the proton, and early theoretical calculations suggested that the strange quarks could contribute significantly more than 10% of the proton's charge or magnetization at the level they measured. "What G0 shows is that there seems to be a strong tendency to be in close pairs," Beck adds. "Observations are often a strong reminder that things are not quite so simple as we might have thought. Although the lightest virtual quarks [up and down quarks in the sea] appear to interact with their surroundings in the proton, there is little evidence in our results that the strange quarks do so. But we are, of course, still thinking about what is going on." Of the four forces of nature, the strong force isn't the only force that can be probed using electrons from Jefferson Lab's CEBAF accelerator. Two other forces that can be quantified are the electromagnetic force and the weak force. The electromagnetic force is the primary force that governs how most of the electrons interact with the protons they encounter. The weak force, on the other hand, can also dictate how electrons interact with protons, but it does so in a slightly different way. G-Zero researchers exploited the difference to get their result. They used electrons that are polarized - or spinning - in a particular direction. The electromagnetic force is unfazed by the fact that the electrons are polarized one way versus another. So scientists will count roughly the same number of protons coming from interactions with electrons spinning in either direction. Not so for the weak force. "The relative difference in those counting rates tells us how big the weak interaction piece is in this scattering of electrons from protons. We compare it to the strength of the electromagnetic interaction between electrons and protons, and that gives us the answer that we're looking for," Beck says. Further, the scientists also counted the electron/proton interactions that they observed from two different angles: those that were knocked forward out of the target and those that splashed backward. 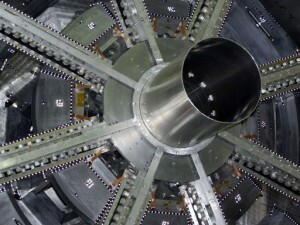 This allowed the scientists to better separate the electric and magnetic contributions. The G-Zero researchers also had one other goal, and it was the trickiest part of the experiment yet. They wanted to see if they could get an extra measurement of the weak force inside the proton. As already mentioned, the scientists were sure they could measure the weak force mediating the interaction of the electron probe with the proton. But it was also possible that they could catch a glimpse of an extremely rare process: the weak force between the proton’s own quarks. This measurement of the proton's so-called "anapole moment" requires the electron to scatter from a quark while that quark is interacting with a neighboring quark through the weak interaction. "They're talking to each other, not through the strong interaction, but through the weak, which is incredibly hard to measure in other ways," Armstrong explains. While the scientists did get a peek at this process, they didn't get enough information to make any bold statements about what they saw. However, they have reported their result in the recent paper in hopes it can provide a starting point for future research. The G-Zero experiment was conducted in numerous sessions in Hall C, beginning in 2002 and concluding in 2007. The recent result was a culmination of these running periods followed by intense data analysis by a team of faculty, JLab staff members and students. More results are expected from other aspects from the G-Zero data. For now, the G-Zero experimenters are happy that they have some of their primary results published and are finally nearing completion of the massive effort it took to carry it out. "The early proposal said we want to measure strange quark effects at the level of about ten percent of the total. We reached our goal, and we're saying any strange quark effects amount to less than that," Armstrong said. G-Zero was financed by the U.S. Department of Energy and the National Science Foundation. In addition, significant contributions of hardware and scientific/engineering resources were also made by CNRS in France and NSERC in Canada. Several other electron scattering experiments, including the SAMPLE experiment at MIT-Bates, the A4 experiment at the Mainz Laboratory in Germany, and HAPPEx at Jefferson Lab were also designed to study strange quarks in the proton.